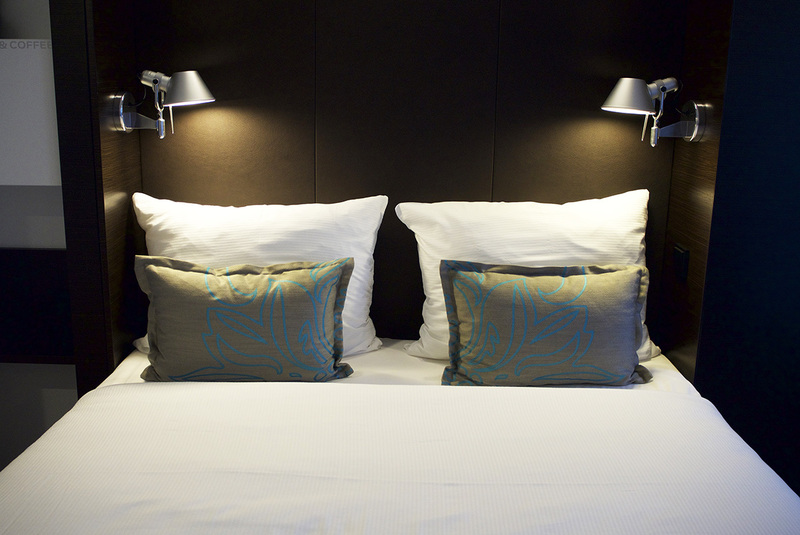 Chances are, you’ve probably never heard of Motel One before. I have to admit, when I first heard the name, I wasn’t sold at all. I had visions of some seedy motel, with rowdy guests, questionable bed sheets and service most definitely not with a smile. Fortunately that’s not the case with Motel One at all. They’re actually a hugely successful chain of budget hotels, originally from Germany, with hotels all over Europe. 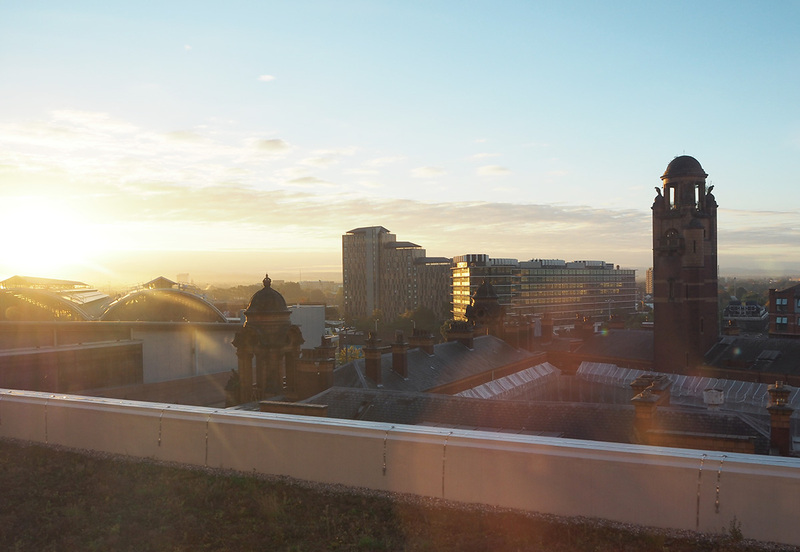 They’ve quite recently started their takeover of the budget hotel scene in the UK, with five hotels including London, Edinburgh(x2), Newcastle and of course, Manchester aka capital of the north! If you’re looking for a place to stay in Manchester that won’t cost the earth but still has style for days, then basically look no further! As far as budget hotel lobbies and lounges go, I usually stay well clear. They’re known for having zero charm and not really being a place that you’d feel comfortable hanging around in with your partner or friends. 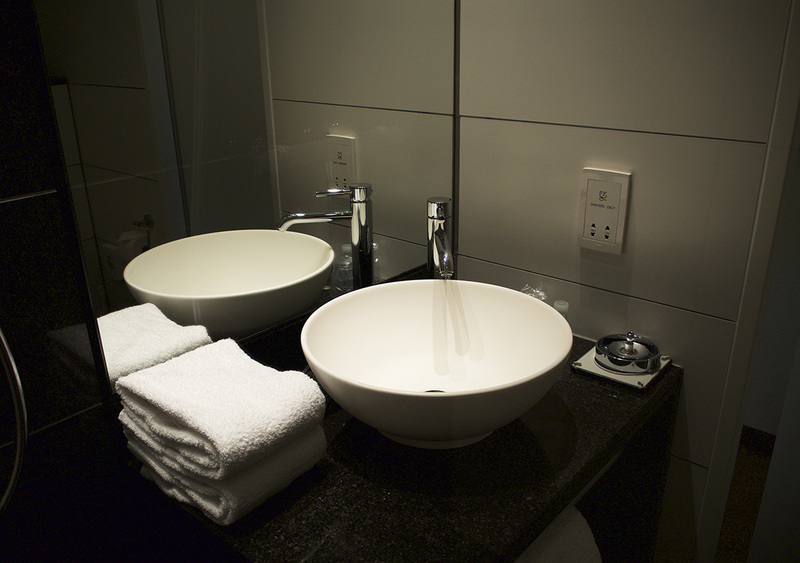 In some budget hotels they’re even non-existent – I’m not sure what’s worse?! 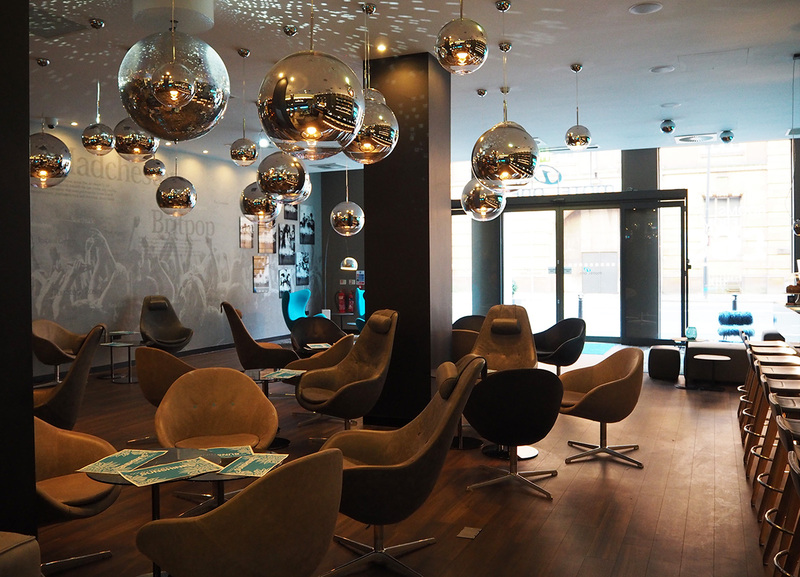 Motel One have really taken inspiration from more luxury hotels with their One Lounges. All Motel One hotels have them but each has its own unique decor that’s specific to its location. 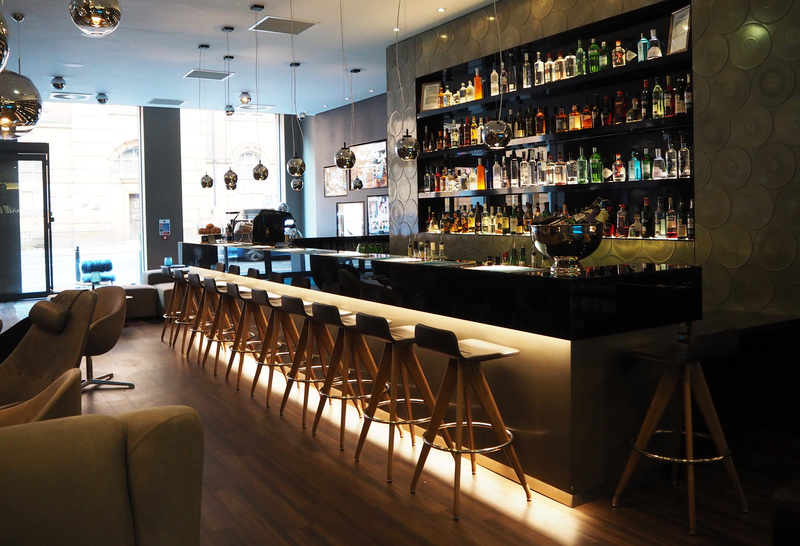 For example, the Manchester hotel is inspired by the city’s musical roots, with nods to its Britpop past. 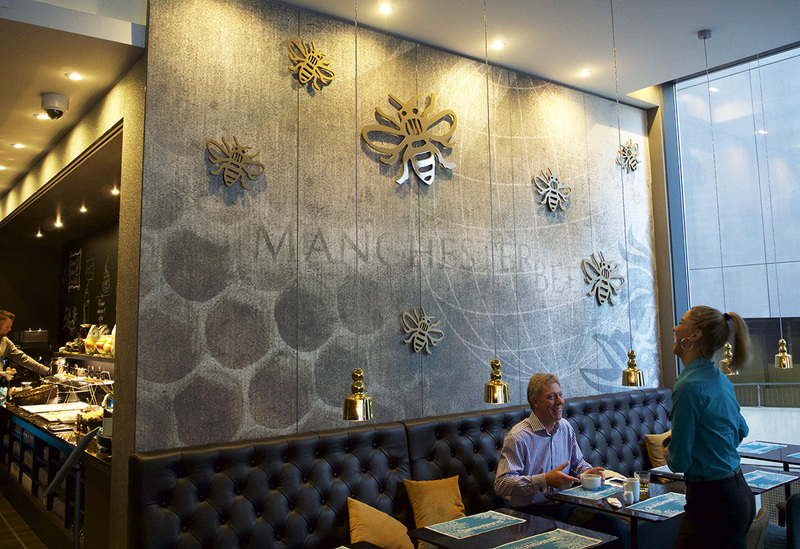 Apart from the strong musical references, the lounge also features Manchester’s worker bees on its walls, which you can find in the crest of the city’s arms. It’s an iconic symbol of the hardworking people of Manchester, particularly during the Industrial Revolution, which I thought was a lovely reference. 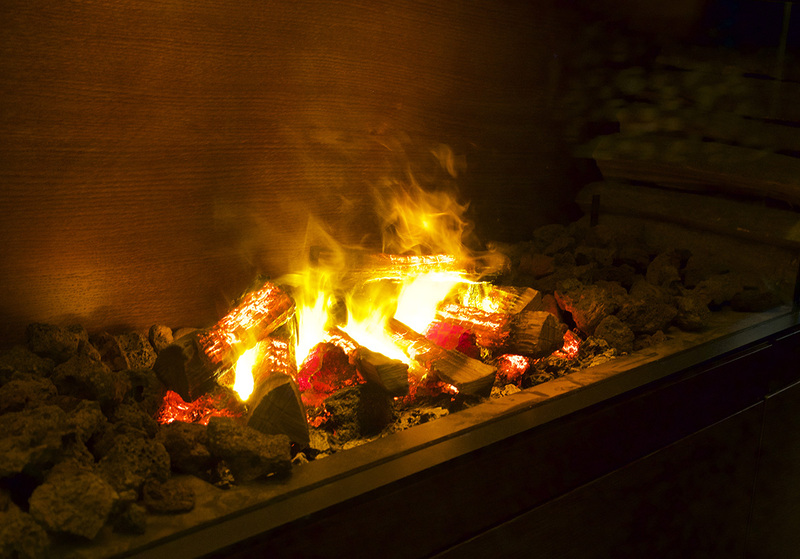 You’ll find a fireplace centrepiece warming the room, as well as dozens of cosy armchairs to relax in. It’s the hub of the hotel and the perfect setting for relaxed breakfasts and sociable drinks with your friends. 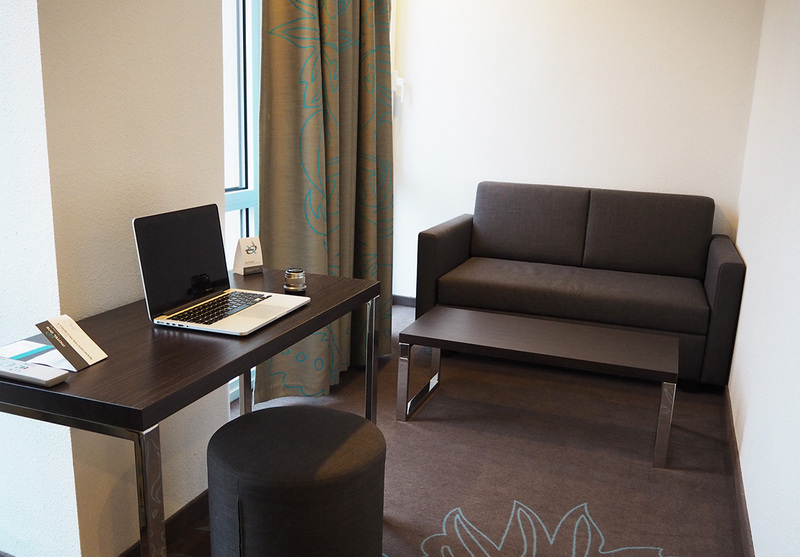 The check-in process is super swift and friendly and you’ll find yourself in your room in no time at all. Luckily (and possibly because I was there on the launch night) I was upgraded to a ‘Family Room’ at check-in, so I was very interested and even a little skeptical to see what kind of room I’d be staying in. If I can make one recommendation with rooms, it’s that you should request a room as high up as possible and preferably at the back of the hotel rather than the front. The front faces the train station, whereas the back has some amazing views of Manchester. 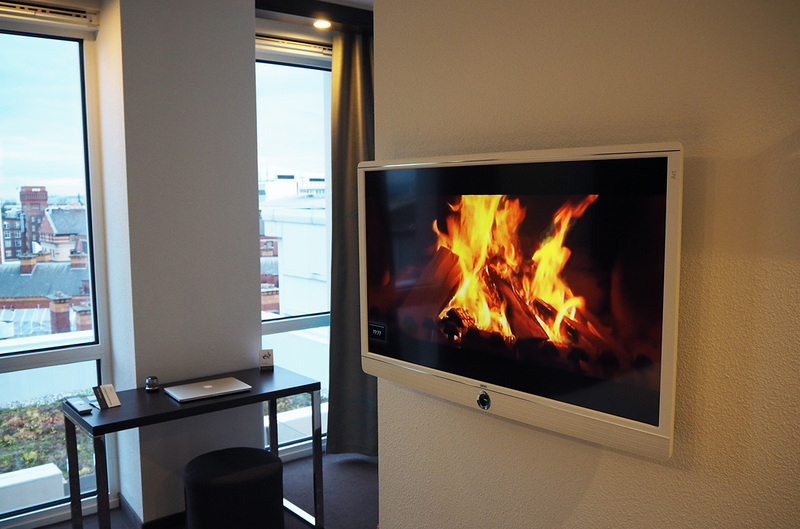 The rooms themselves are full of the usual Motel One luxury and simplicity. It has everything you would need but absolutely nothing that you wouldn’t, whilst also looking more like a stay in a Hilton hotel than a stay in a Travelodge. The beds are big and comfy (massive tick from me!) and the addition of a desk means it’s great for business types who might need to get a little work done. 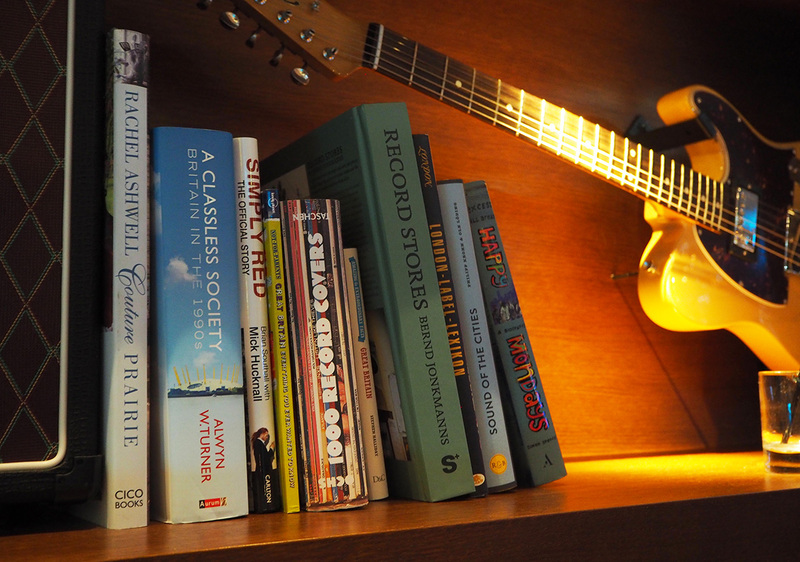 Wifi is free & fast too… always important. As for the price? 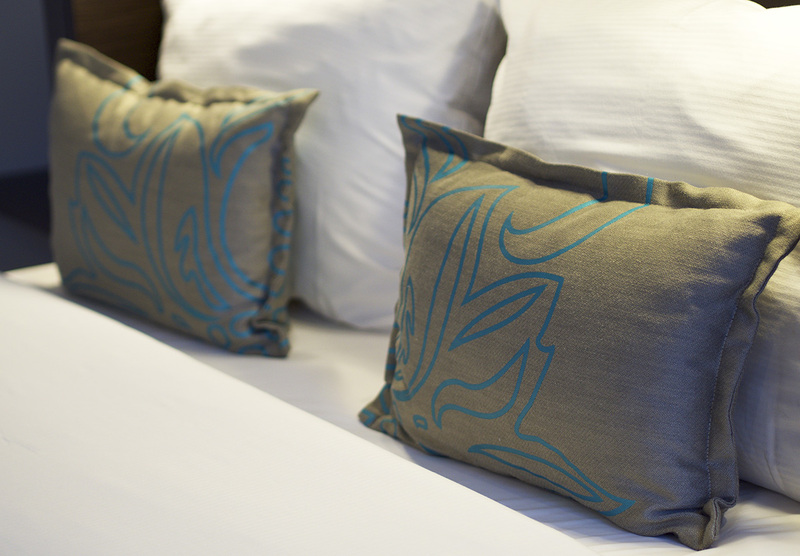 Single rooms start from £69 per night and double rooms from £84 per night, so it’s definitely one of the most purse-friendly places to rest your head in Manchester. The family room is the priciest of the three room options, but this features a sofa bed that’s perfect for little ones to rest their heads. It’s also a touch more spacious than the other rooms, so everyone can have enough space to get ready for an exciting day ahead in Manchester. From 6am, the One Lounge is transformed to breakfast heaven with a buffet style breakfast offering. They pride themselves on making breakfast quite a healthy affair, with an abundance of granola, cereals, fresh fruit and juices available, as well as some very tasty pastries, breads, cheeses and plenty of hot drinks to wake you up. I definitely missed the option of hot food here, as I’ve become fond of having some form of eggs for breakfast, but for £9.50 you can still find yourself full after a few trips to the pastry section! I had very low expectations of my stay at Motel One and I really thought it would be on a level with a standard budget hotel, but I was really surprised at what they’ve managed to achieve here. The price point is super low for such a central location and in comparison to other hotels in its price range, it really does blow them out of the water in every aspect. It’s literally opposite Manchester Piccadilly train station, without any of the noise, which is perfect for those visiting for business or pleasure. 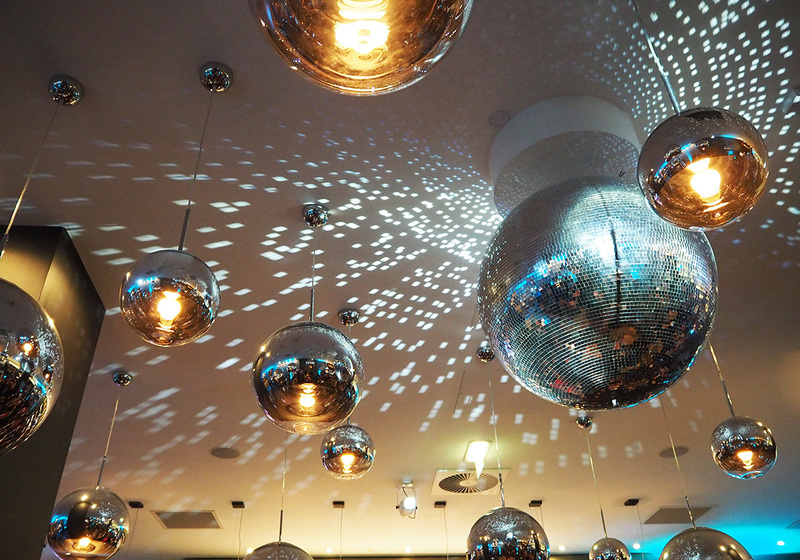 Disclaimer: My one night stay at Motel One Manchester Piccadilly was complimentary of Motel One as their launch party guest, but all thoughts & opinions are my very own! 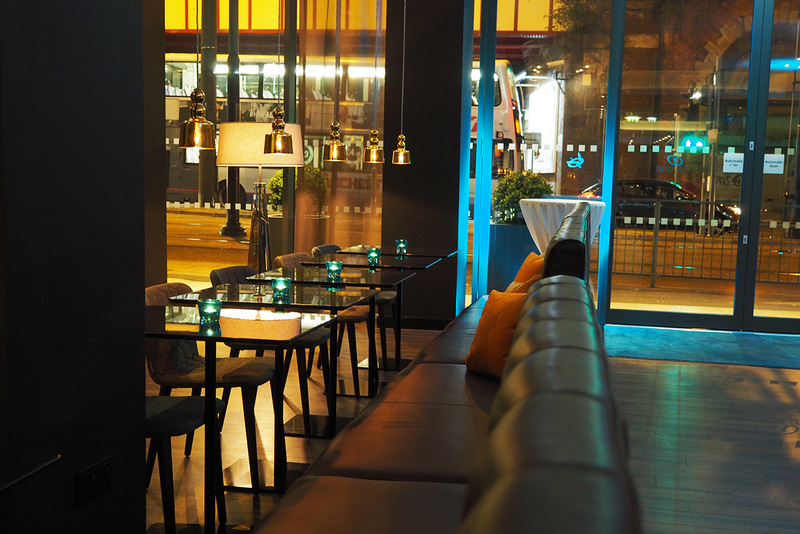 You can find out more about Motel One Manchester and book your stay directly on their website here.